Aaahhhhh…..Siberia! From the deep taiga of the Russian Far East we emerged onto the open rolling steppe of southeastern Siberia. The mosquitos decreased in number, the sky was blue, the villages were prettier and the landscape was nice and open with great view across the plains. We also saw proper, asphalted side roads to the main transsiberian highway, which otherwise had been a one-road thing for thousands of kilometers, from Khabarovsk to Chita more or less. The area around the Baikal Lake is a good place to spend some time on the long journey through Russia. We stopped first in the small villages belonging to the Old Believers around 50 km south of Ulan Ude. The Old Believers separated from the official Russian Orthodox Church in 1666 as a protest against religious reforms. They fled to remote locations in Siberia or the Russian Far North to avoid persecution. The Old Believer villages of Desyatnikovo and Tarbagatay are beautiful and worth a visit with their traditional and very colourful Sibirian log houses. Ulan Ude is a pleasant, friendly and laid back city. It is the capital of the Buryats, the largest ethnic group of Siberia and it has an exotic, not-so-russian feel to it. The largest Lenin head in the world gazes out over the central square, surrounded by nicely renovated classical buildings of grand Stalinist style. 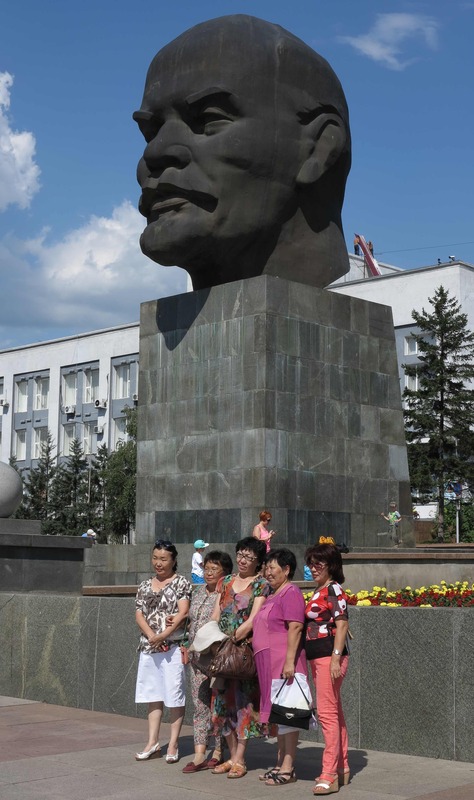 If you visit on a weekend, you will find a constant flow of newly wed couples passing by Lenin’s head to have their photos taken together with families and groups of ladies dressed up for the weekend outing. It is really a lovely place to relax and let the life of Ulan Ude pass by. The religion of the Buryats is a mix of shamanism and buddhism. The shamanism is strong on for example the Onkhol Island in the Baikal Lake, one of the spiritual hot spots of Siberia. And just outside Ulan Ude there is the oldest buddhist datsan of Russia. As an absolute exception, the Buryats got a special permission from Stalin in 1946 to build their buddhist temple and school close to a small village south of Ulan Ude. Today the Ivolginskii Datsan is a busy and ever-expanding temple complex with a buddhist university attended by students from all over Russia. We visited the datsan in the late afternoon and planned to camp in the parking lot outside for the night. As we were there making pancakes for dinner, Valery and Dennis came by to see who were these two dubious strangers! 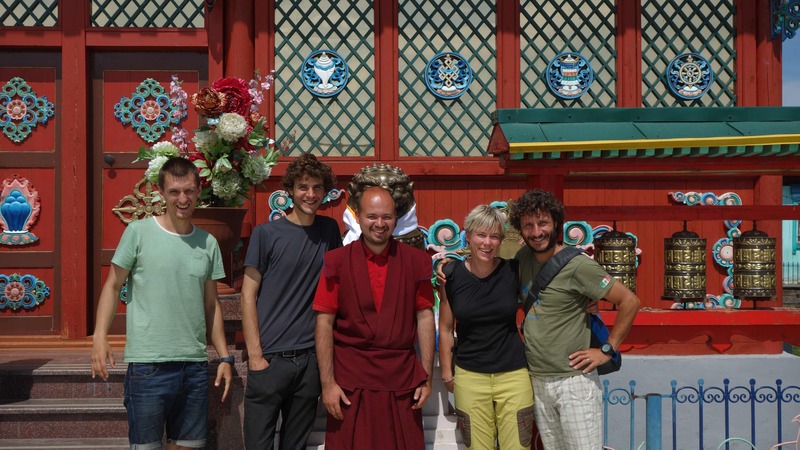 Valery has already studied 3 years at the buddhist university inside the datsan, while Dennis is considering to start. They were two very pleasant guys and we gladly accepted the invitation from Valery to show us around the datsan the next day. 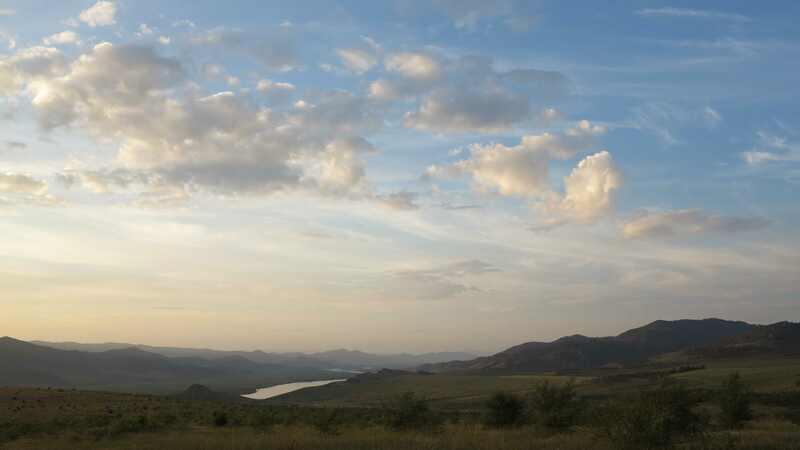 From Ulan Ude we continued to the Baikal Lake. We bought the local omul fish, freshly smoked and still hot, from a lady by the side of the road and ate it with the tasty dark Russian bread on the shore of great Baikal Lake. It is a little bit magical to find this huge glittering blue lake in the middle of the huge landmass of Russia. Our main destination was the Onkhol Island in the middle of the Baikal Lake, a major spiritual location for the Buryats. So after a night of camping on the southern shore of the lake, we pressed on to arrive to Onkhol. Unfortunately the weather was in our favour. It turned grey and rainy….. On top of that, the island seemed to have experienced a boom in tourism since Malene was there 4 years ago. First of all we waited 3 hours to go on the ferry, which runs continuously across the narrow straight to the island. Then when we arrived to Khuzhir, the main village on the island, the first thing that greeted us was a huge sign advertising a DISKOTEK from 24.00 till sunrise….hmmm! On top of that it turned out that we had to pay around 10 EUR per night to camp on the island or sleep in our car. And it was raining. 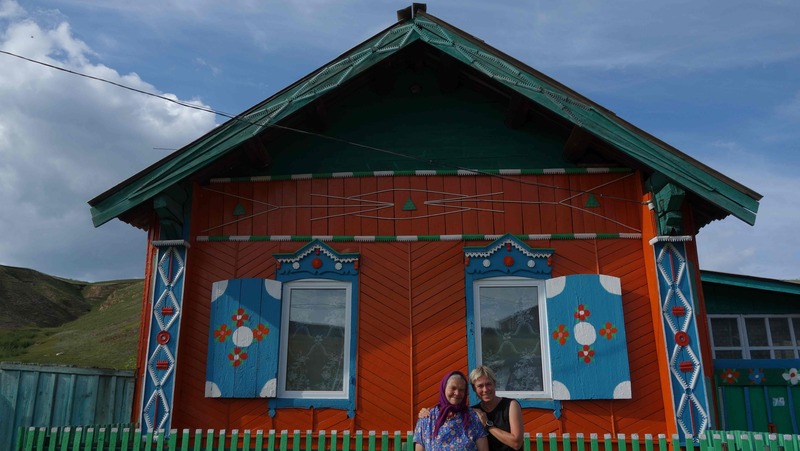 All in all, the atmosphere of this shamanistic spiritual center of Siberia was not as we had expected or as Malene remembered it, so the next day we left and went to Irkutsk. For a while we had been feeling like the rain gods, bringing with us big rain and hail storms all across the Far East and Siberia. Then we had rain on the otherwise sunny Onkhol Island and now we had rain also in Irkutsk. 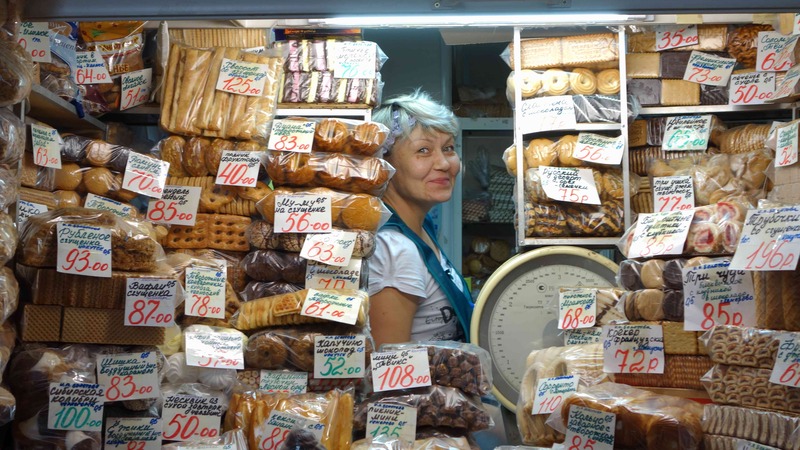 At least we enjoyed the old style indoor market with its small booths, each packed with goods like biscuits, candy, bread etc and only a small window for the lady to take your order and hand out your purchase. But then we left Irkutsk, no reason to hang around in the rain. 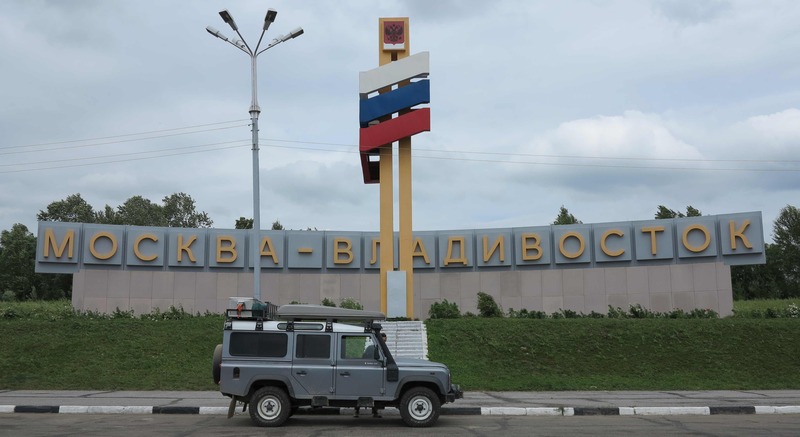 We continued to Krasnoyarsk, a little over 1000 km further west along bumpy roads with lots of road works. Tiring. Traffic increased a lot west of Ulan Ude and Russians are in general absolutely reckless drivers. Finally we arrived in Krasnoyarsk……and it rained! We still enjoyed a good run along the river, a good shower in the grand train station, a good lunch of pelmini and vareniki and a visit to the city historical museum. A bit of civilization! Then we were on the road again. We had around 1900 km to drive to Yekaterinburg. The distances in Russia are incredible and there is almost nothing in between the big city centers, at least when you are still east of the Ural Mountains. On the way to Yekaterinburg we passed through Tomsk and Omsk, both big cities by big rivers. 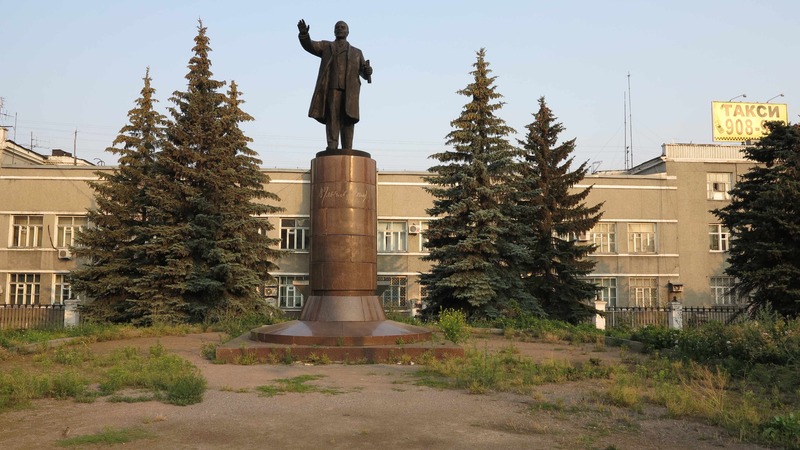 There is not a lot to see in either Tomsk or Omsk but they make a pleasant stop on the long drive west. Now we are in Yekaterinburg. And it is raining!!! What to do. The Russian farmers must be more than happy to have us driving through Russia with all the rain we are bringing. Da svidaniya and good night from the Urals! It is six days now that we are driving west. We left Japan by ferry from Wakkanai to Korsakov, from the northern tip of Hokkaido to the southern end of Sakhalin. We enjoyed a week on Sakhalin Island where we met Elena who took us out for crab fishing with Pavel. A culinary feast on the beach! And we drove north for a day to enjoy the long and beautiful coastline of southeastern Sakhalin. But in the end we found our souls longing to start the long trip west through Russia. We longed to feel that we were getting closer to home. 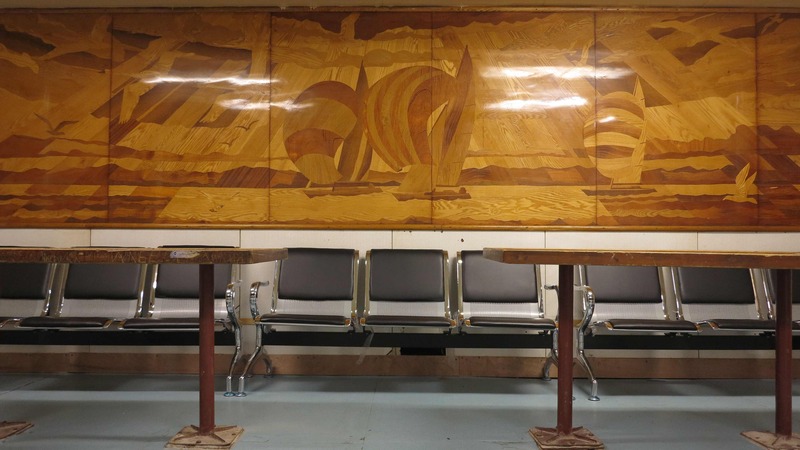 The ferry from Sakhalin to mainland Russia takes up to 18 hours and is an experience! It is a looooong trip but unless you lock yourselves up in your cabin (which is not a very nice place to be) you are bound to meet up with your fellow passengers who in our case made our trip feel so much shorter and more enjoyable! We arrived in Vanino in the morning after a quiet night at sea and immediately started driving west. Our intention was to explore for a while the far eastern region of Russia. It sounded like a great and exciting place to travel, so vast, so isolated, so wild. In reality, it was more or less like this but we also found it full of mosquitos, biting flies, horseflies and ticks – and a lot of garbage. Whenever there was access to a nice spot by the river, it was full of garbage! A shame!!! Far eastern Russia probably is heaven for the dedicated fisherman or the serious hunter but we just wanted to escape from it as quickly as possible! It is “para macho”, for the real man! Ok, we knew that there would be mosquitos, but we just never imagined that there would be so many and that they would be so hungry. Whenever we stepped out of the car we were running around and waving our arms in panic in a useless attempt to avoid being attacked by trillions of mosquitos or an army of enormous horse flies. It was actually comical……the Russians were there enjoying on the bank of the rivers (often surrounded by mountains of garbage), in sleeveless shirts and shorts or in their swimming outfits, apparently untouched by the biting bastards! They watched us with an ironic smile as we smashed our electric mosquito ketcher through the air and they asked us “which kind of sport are you playing there”? How can they do it??? We don’t know. 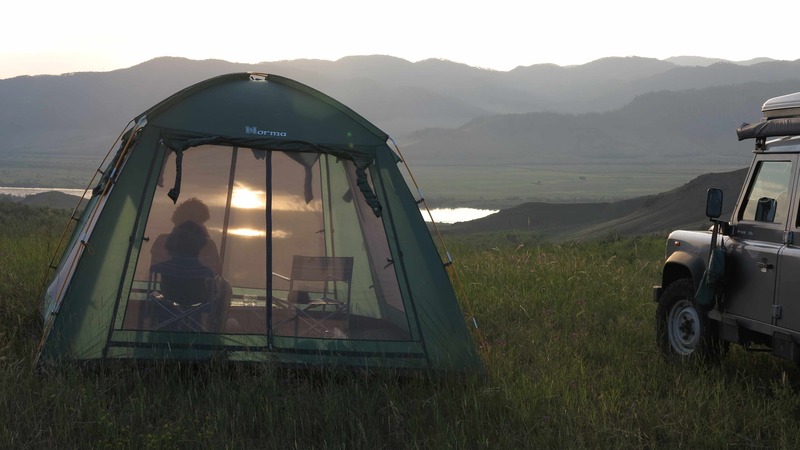 A typical day for us would go like this: In the morning, Marco started by opening the zip of the tent slightly, just enough to stick out his hand with the electric ketcher to kill the first 300 mosquitos which were there stuck to the screen door. Then we jumped out, took down the tent as quickly as possible, ran inside the car and drove away. During the day, whenever we stopped the car, we would immediately be surrounded by enormous horse flies. They circled around Frida, waiting for us to come outside. In the evening we were attacked by zillions of big, strong and fast mosquitos as soon as we left the car. They bite through clothes without any problem and they are fast! Additionally there were still the big horse flies and smaller biting flies. We ate bread and cheese with chili sauce in the car….. no cooking, no hot meals. After eating we jumped out and put up the tent as quickly as possible. Finally inside the tent, all doors and windows closed, the interior checked for mosquitos, we could crawl under the duvet and relax….to the sound of the nerve wrecking bzzzzzzzzzzzzzzzzzz of the zillion mosquitos who were now attached to our tent, just cm away from our skin, driven to madness by the smell of our sweet blood! We had to be carefull not to rest an arm or a leg against the screen door of the tent during the night because then ZACK they would be there immediately biting us, the small bloodsucking bastards! Really, this was just the first two days. And we will leave it to the reader to imagine the stress and agony of any toilet business. We were desperate to escape!!! So we arrived to Khabarovsk on the morning of the third day. We had breakfast and coffee in a large parking lot – free of mosquitos! We boiled 10 eggs to have for lunch in the car the next few days. And then we went hunting for the solution to our problem…. We found an outdoor shop and bought a big mosquito tent, 3×3 meters floor space and 2 meters high! Now we only have to suffer the 5 minutes it takes to mount the tent. Inside the tent we can make our exercises, we can cook, eat and wash while we are pointing our fingers and laughing at the army of biting insects which have not been invited inside for the party! Ha! We still changed our travel plans though. 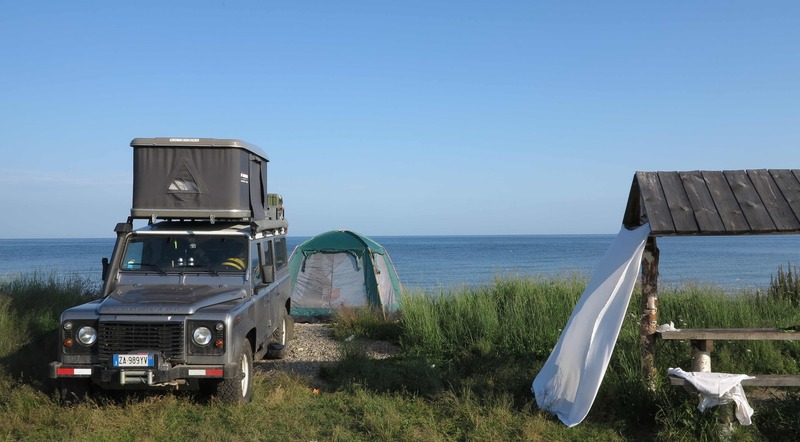 Even equipped with the mosquito tent, we decided not to make the 2000 km round trip north to Yakutsk. The thought of the heat, the mosquitos and the bad road made us change our mind. Now we are heading for the Baikal Lake with a stopover at the Buryat capital of Ulan Ude and the buddhist datsan at Ivolga. And to come back to Far Eastern Russia some day? Maybe in the winter!! here is Eva and Stefan, with the white Unimog Truck from Irkutsk! We have one hint against mosquito: A hat with mosquito net! Perfect for the toilet in the forests of the Taiga!